Mond returns and became a strider. 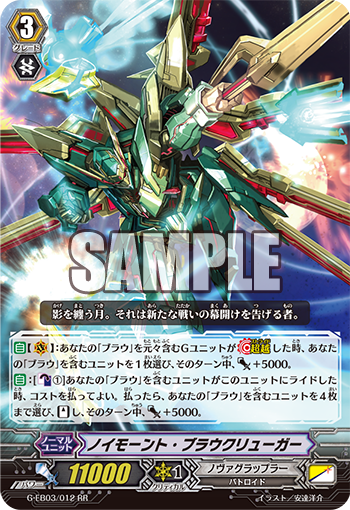 AUTO (VC) When your G unit with “Blau” in its original card name Stride, choose one of your units with “Blau” in its card name and it gets Power+5000 until the end of the turn. AUTO [Counter Blast 1] When your unit with “Blau” in its card name rides this unit, you may pay the cost. If you do, choose up to 4 units with “Blau” in its card name, Stand them, and they get Power+5000 until the end of the turn.